Please join us at our meeting on Tuesday, April 9, 2019. Our next meeting is Tuesday, April 9, 2019 at 7:00 PM at 7370 W. Grand Avenue, Elmwood Park, IL. Our meeting includes an all you can eat dinner buffet for $20.00 per person. Join us on Facebook. Please friend us and contribute to our page. Below is a study Evaluating the Effects of Police Body-Worn Cameras: A Randomized Controlled Trial. The Employee Assistance Program (EAP) is available to provide confidential supportive assistance to all sworn and civilian department members, members of their immediate families, and retired sworn members. The department has created a brief anonymous survey and encourages all members to participate. The survey can be accessed from many platforms, such as desktops, smart phones, and tablets, by pasting the following link into your browser: www.surveymonkey.com/r/CPDEAP. Recommended browsers include Google Chrome and Mozilla Firefox. Participation in this survey is strictly voluntary. For more information concerning EAP services, contact the EAP directly at 312-743-0378 or refer to E06-01, "Professional Counseling Service/Employee Assistance Program." Below is the City of Chicago Office of Inspector General's (OIG) published audit of the Chicago Police Department's (CPD) controls related to regular-duty overtime from 2011 to 2016 dated March 14, 2017. Chicago Police Department "Next Steps for Reform" dated March 14, 2017. Reparations Won: A Case Study In Police Torture, Racism and the Movement for Justice In Chicago Middle School United States History Curriculum CPS by the Department of Social Science and Civic Engagement. Investigation of the Chicago Police Department by the U.S. Department of Justice Civil Rights Division dated January 13, 2017. The Chicago Police Council of the KNIGHTS of COLUMBUS, St. Michael the Archangel, Patron of Police, Council #12173 was formed in 1995, the 1st Police Council of its kind for male members of the Catholic Faith, to share in CHARITY, UNITY, FRATERNITY and PATRIOTISM. We open our doors to the Law Enforcement communities, both active and retired in a spirt of camaraderie. All Departments, Agencies, Bureaus and Suburbs are welcome. Military members also find comfort in our ranks, ALL ARE WELCOME. Our members come from approximately 25+ surrounding communities and we strive to make our existence known to even more. We meet the 4th Wednesday of the month at FOP Hall, 1412 W. Washington Blvd. at 1900 hrs. With the guidance of our Chaplain, Fr. Dan Brandt we have initiated a membership drive and this would be your opportunity to step up and be part of something exceptional. Now is the time to mark your calendars and bring a friend. ALL ARE WELCOME. Please RSVP to Dennis P. Fitzgerald, Grand Knight by' phone or text to 773-934-8961 so adequate food and refreshments can be on hand. Interesting article by ProPublica, DNA Dragnet: In Some Cities, Police Go From Stop-and-Frisk to Stop-and-Spit examines how police in Florida and other states are building up private DNA databases, in part by collecting voluntary samples from people not charged with, or even suspected of, any particular crime. The Police Executive Research Forum (PERF) is a police research and policy organization and a provider of management services, technical assistance, and executive-level education to support law enforcement agencies. PERF has released Guiding Principles on Police Use of Force. This report documents three national conferences in which police leaders discussed strategies for reducing use of force in certain types of situations; a national survey of police agencies on their current force training; and field work by PERF in the United Kingdom and the NYPD's Emergency Service Unit. The Police Accountability Task Force Report summary opinion of the Chicago Police Department. Indiana Tech online education program gives you the opportunity to earn a degree from an accredited university when, where, and how its convenient for you. Online classes are offered in an accelerated, interactive format that allows you to progress quickly while working from anywhere. Most classes span five weeks for undergraduate courses and six weeks for graduate courses. Although the classes do have specific start and end dates, you are not required to be logged in at particular dates or times. Just access the material when it is convenient for you each week. You will have plenty of opportunities to interact with faculty and classmates online. The Department of Justice (DOJ) created the Officer Safety and Wellness (OSW) group and began a study to determine the causes of the increase. What they found was enhanced officer safety kept floating to the top of the list. Improving or creating a culture of safety within departments needed more attention. OSW identified 16 priorities needing attention. The U.S. Attorney General deemed the top three as having highest priority: gunfire injuries and death; premeditated and unprovoked ambush situations; and rifle/long-gun threats/assault weapons. Other areas of focus include physical health and mental wellness;enhanced training; better situational awareness; and improved leadership and safety practices. Appropriate and proactive safety awareness is especially important within smaller departments, where covering even one or two vacant positions can strain the active personnel in the department and add a great deal of money in overtime costs. A recent article in Public Management Magazine discuses the affect of officer deaths and needed safety changes to departments and management at the local level. It is important to take all precautions to protect your identity. Identity theft is a fast growing crime. Identity theft/fraud are terms used to refer to all types of crime in which someone wrongfully obtains and uses another person's personal data in some way that involves fraud or deception, typically for economic gain. The below icon is a link to the Federal Trade Commission's (FTC) web page and explains why you need to take precautions to protect yourself from identity theft and what you should do if you are a victim. Italian American Police Association member, retired judge and lawyer, Sam L. Amirante published John Wayne Gacy: Defending a Monster with retired lawyer Daniel J. Broderick. The book is available in soft cover and e-book editions. On the website Legal Talk Network and Lawyer2Lawyer Sam and Daniel discuss their book, John Wayne Gacy: Defending a Monster, and the constitutional right to a defense. Nutrition, diet and exercise are important for a healthy lifestyle. Check out Weight Chart.com to track your own physical fitness program. To start just click the below banner and it is FREE. The Weather Channel broadcasts weather forecasts and weather-related news, along with documentaries and entertainment programming related to weather. New members are always welcome. If you would like to become a member or renew your membership click here. Answer the Call for the Illinois State Police. Click the below banner for information and registration. Answer the Call for the Chicago Police Department. Click the below banner for information. Please explore our Links button. 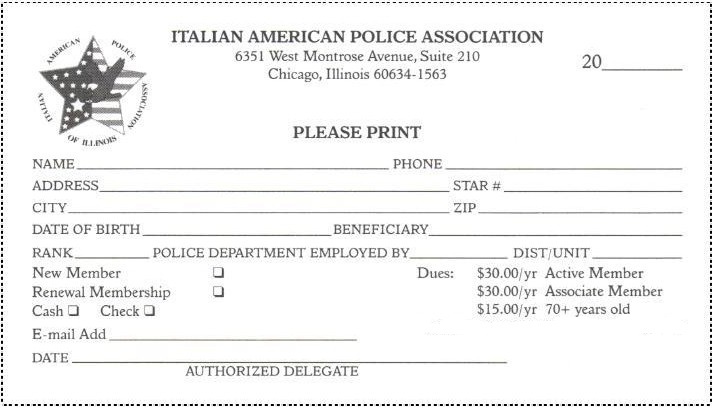 Please consider patronizing our friends and sponsors of the Italian American Police Association of Illinois. Copyright ©2019 The Italian American Police Association of Illinois. All Rights Reserved.